To celebrate NetSupport’s 30th anniversary, a bundle of new features for NetSupport DNA and NetSupport School will shortly be released, providing extra platform support and tools to help schools further safeguard students. A whole host of enhancements will been added to the Windows version of NetSupport DNA based on customer feedback and requests. Just some of these include: detecting whether volumes on hard drives/USB drives are encrypted (BitLocker); and enabling power management and internet metering features to be set to 15-minute intervals, rather than 30 minutes. For Safeguarding Leads, there will be improvements made to the ‘Review triggered phrases’ interface to make reviewing items simpler – plus, the world cloud will soon show triggered phrases colour coded based on word priority, to make it easier to spot high-risk trending keywords. Adding to the breadth of platforms supported, the new Android Browser and iOS browser apps within NetSupport DNA will allow organisations to monitor and manage Android and iOS device activity on their local network. The Mac Agent in NetSupport DNA already provides inventory and real-time monitoring, plus safeguarding features. However, this latest update will include improved deployment using third-party tools such Apple Remote Desktop – making it even easier to set up and configure Mac devices. This allows safeguarding staff to access key information and alerts from triggers across the school’s local network while on the go. This fully secure, Azure-hosted console also includes a smartphone-optimised user interface to help staff to quickly search for a specific child and review any recent alerts or concerns – thereby enabling a speedier response when an urgent phrase or keyword is triggered by a vulnerable student. Unique to NetSupport DNA, the new contextual intelligence-based Risk Index will automatically flag high-risk events and vulnerable students, based on sophisticated contextual AI risk analysis. It assesses the context and history of a child’s activities on the school network – from the time of day, devices used, and websites visited (including previous alerts they may have triggered) – and, from this information, creates a numerical risk index. A high-risk index could result if a child has repeatedly researched a safeguarding topic (e.g. suicide) out of hours, in an unmonitored setting such as the library. A lower index rating could result from a student searching a lower risk keyword in a local application during school hours that may have been used for curriculum topics. All the monitoring and assessment of these alerts is done locally by the school (no third-party services are required) and so the data is fully secure. This allows staff to focus on high-risk alerts (where there is more likely to be a genuine risk) and allows them to apply their professional judgement. 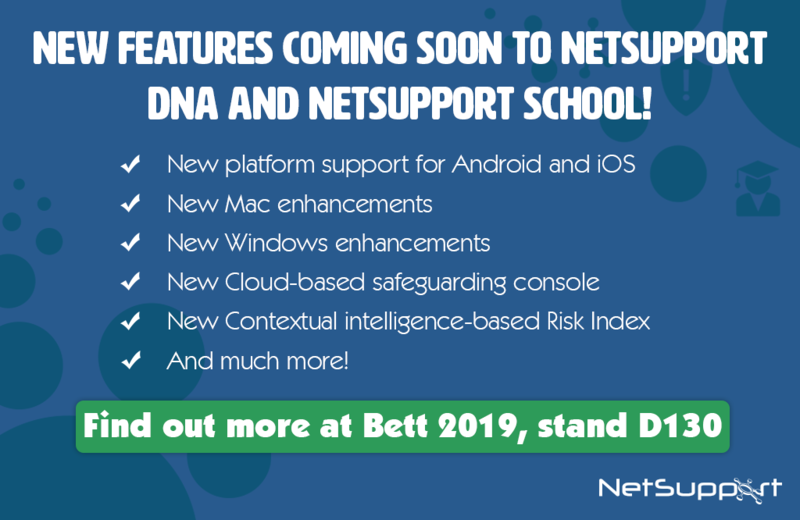 For more information about these updates, visit NetSupport on stand D120 and D130 at Bett 2019.